Prince Charles has become the longest-serving heir apparent in British history. The previous record, of 59 years, two months and 13 days, was set by his great-great-grandfather, King Edward VII, Clarence House said. The Prince of Wales became heir apparent at the age of three when his mother, Princess Elizabeth, acceded to the throne on 6 February 1952. 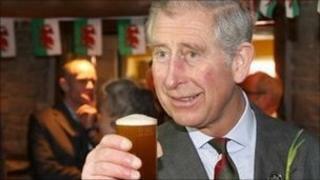 Charles, now 62, was nine when he was given the title the Prince of Wales. Edward VII was born the heir apparent on 9 November 1841 as his mother, Queen Victoria, was already on the throne. He took over as King when she died on 22 January 1901. The first in line to the throne is generally the eldest son of a sovereign, unless the monarch's children are all female. However, Deputy Prime Minister Nick Clegg recently said the government would consider changing the laws on royal succession to remove the right of male heirs to succeed before older female siblings. He said both he and Prime Minister David Cameron were "sympathetic" to changing rules which seemed "a little old fashioned". But he added that it was not straightforward, because the decision would have to be approved by the Commonwealth realms, where the British monarch is also head of state. Former editor of the Daily Telegraph Sir Max Hastings suggested that Prince William could succeed to the the throne ahead of his father. "Would it be in everybody's interest, including those of the Prince of Wales, for a new, young, next generation, Prince William to succeed to the throne?" he asked, in a BBC News interview. "I think an enormous amount will depend on what seems to be the will of the British people." But Prince William's godfather, Constantine, the former King of Greece, told the BBC he does not expect this to happen. Constantine, who was overthrown in 1973, dismissed recent polls which suggested the majority of Britons would prefer Prince William to leapfrog Prince Charles to the throne. Constantine, who will be a guest at the royal wedding, described William as "straightforward, honest, hardworking and never losing his sense of humour". But he said of the line of succession: "It works from father to son or mother to son and that's how it goes. They have to wait their turn... that's how it should be because we are not politicians."